Mon­tréal indie band Arcade Fire, found­ed in 2003 by hus­band and wife Win But­ler and Régine Chas­sagne, released their third LP, The Sub­urbs, on Tues­day. In those sev­en years, the band has become steadi­ly more pop­u­lar, and, after win­ning both a Mete­or and a Juno Award for their last album, 2008’s Neon Bible, as well as being nom­i­nat­ed for a Gram­my for their last two albums, Arcade Fire has become one of the best known groups in the genre. It’s a well-earned rep­u­ta­tion, too - Funer­al (the band’s first album) and Neon Bible were com­mon sights on lists of the decade’s best. With The Sub­urbs, Arcade Fire has changed direc­tion some­what, but with­out los­ing too much of the ener­gy that has made them excel­lent. But­ler and Chas­sagne, as with most of Arcade Fire’s music, share vocals on The Sub­urbs. One of the best things about the band’s music has always been the shared vocal melodies between the two, and the con­trast that cre­ates with the solo sec­tions. Butler’s plain­tive voice cre­ates a dif­fer­ent sound than does Chassagne’s more melod­ic tones, and it’s that dif­fer­ence (com­bined with instru­men­tal skill, of course) that allows the band to cre­ate such var­ied and suc­cess­ful sound, whether the duo share or divide the musi­cal land­scape. Arcade Fire has always writ­ten albums pop­u­lat­ed by simul­ta­ne­ous­ly vivid and abstract images, singing about real­i­ty from a col­or­ful­ly poignant point of view. The Sub­urbs is no excep­tion. Whether it’s the rem­i­nis­cence of “sum­mers star­ing out the win­dow” in “Wast­ed Hours” or the view through a “dead man’s eyes” on “Half Light II (No Cel­e­bra­tion),” every image on The Sub­urbs evokes not only the singer’s own mem­o­ry but pic­tures from those of the lis­ten­er. Unfor­tu­nate­ly, judged sole­ly on its instru­men­tals, it’s hard not to feel that The Sub­urbs is frankly, appal­ing­ly mis­man­aged. 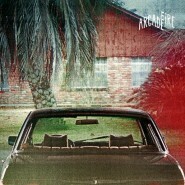 With the band’s newest album, Arcade Fire seems to have gone for a sig­nif­i­cant­ly lighter, less pop­u­lat­ed sound. The only prob­lem with that is that the band’s orches­tral­ly dense, flow­ing sounds were what made them so excel­lent in the first place. The Sub­urbs has no “Black Mirror“s, no over­whelm­ing waves of sound and emo­tion. Instead it is pop­u­lat­ed most­ly by gui­tar heavy lengths of what sounds more or less like filler; min­utes and min­utes of rep­e­ti­tion are far too com­mon, all of it lead­ing nowhere. As an extreme exam­ple, the worst offend­er of the lot, “Roco­co,” employs across most of its length a heavy-hand­ed, repeat­ed, uni­form strum­ming that tries its best to change notes as infre­quent­ly as pos­si­ble. The overt­ly bor­ing, com­plete­ly unin­ter­est­ing result is actu­al­ly some­what nau­se­at­ing. How­ev­er, to say that there’s noth­ing mer­i­ta­ble about The Sub­urbs would be a gross over­state­ment. There are still hints of that beau­ti­ful­ly fleshed out sound that tru­ly define Arcade Fire, but they are just that: hints. The album is pop­u­lat­ed with inter­est­ing­ly placed, quite intel­li­gent strains that seem to defy the pedes­tri­an gui­tar. The album tru­ly tries to make you want to like it, and that cer­tain­ly counts for some­thing. And of course, there’s “We Used to Wait.” A far shot from “Black Mir­ror,” it’s still the clos­est thing to it, and, set as it is on an entire­ly dif­fer­ent lev­el than most of The Sub­urbs, it shines. Still, The Sub­urbs is not the best album. It will undoubt­ed­ly stand eclipsed by both Funer­al and Neon Bible, but it, despite every­thing, is still a great album. Even though the instru­men­tals and over­all sound are noth­ing like that of its pre­de­ces­sors, a lot of it man­ages to work. That is for the most part due to the top notch vocals and strong lyrics, but, to be com­plete­ly fair, “We Used to Wait” is def­i­nite­ly not the only musi­cal­ly engag­ing or inter­est­ing track. Arcade Fire has man­aged to pull of an album that works despite all too many faults, but at the same time, an album with­out such prob­lems would have been even bet­ter.